Bantwal, June 28, 2015: The victory celebration following the Student Union election of Vittal Pre-University College resulted in a clash between two groups on June 27, Saturday. One student was injured in stone pelting during the clash. 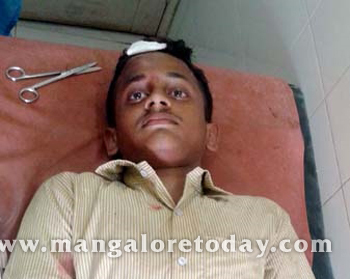 The injured student is Kiran Raj Rai (18) from Manchi. Soon after the incident, the clashing groups intercepted vehicles moving on the Vittal-Salettur Road. Earlier in the day, Yogish, a second PUC (Commerce) student had won in the election following which a holiday was declared. However, soon after when his supporters wanted to celebrate inside the college premises, the college authorities turned down their demand. When they then decided to celebrate outside the college premises there arose a clash with another group which did not want any celebration. It is said Mohammad Ashfaq, a student of the rival group threatened the group of supporters of the victorious students, a complaint lodged with the police by Kiran, the injured student said.